We’re getting close to that period of the summer when algae starts appearing on the Yahara lakes. The primary culprit behind the growth of the green, smelly mess is phosphorus, a nutrient that rainwater and snowmelt wash into the lakes from farm fields and city streets, and which subsequently promotes plant growth in freshwater. Algae are not just ugly and smelly; when algae die, they are consumed by bacteria, which use up oxygen in the water, compromising habitat for fish and other organisms. 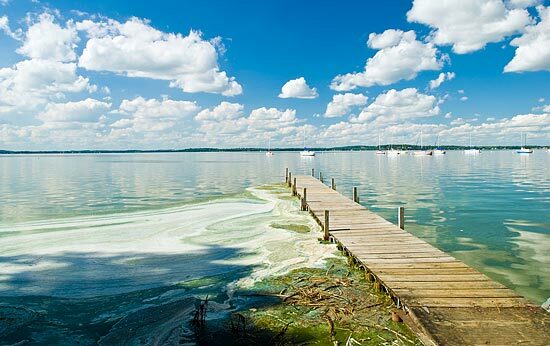 Politicians are savvy to the damage this nutrient can do to the lakes. Former Dane County Executive Kathleen Falk called phosphorus runoff “Public Enemy Number One.” The current Executive, Joe Parisi, has similarly embraced the call to phosphorus reduction, notably promoting the construction of new manure digesters that remove much of the phosphorus from animal manure. Local agencies are trying new policy options to address this “public enemy.” One new program is called the Watershed Adaptive Management Option (WAMO), which offers an alternative for a regulated source of water pollution, such as a wastewater treatment plant, to come into compliance with limits for phosphorus levels in their effluent and the receiving water body (the river or stream into which effluent is released). These limits are set by the Wisconsin Department of Natural Resources’ Phosphorus Rules and the US Environmental Protection Agency’s Clean Water Act. With WAMO, instead of investing in expensive technology upgrades at the treatment plant, the regulated polluter can pay other sources of phosphorus in their watershed, such as farms that are unregulated under the Clean Water Act, to keep the nutrient from running off into streams and lakes—ultimately, a cheaper option. In the Yahara Watershed, the Madison Metropolitan Sewerage District (MMSD) is in a pilot phase of a Watershed Adaptive Management Option permit. Thirty organizations–municipalities, utilities, and nonprofits–signed a memorandum of understanding to fund and cooperate in this pilot phase, which is confined to a small area of the Yahara Watershed: the Sixmile Creek sub-watershed at the top of the chain of Yahara lakes. So far, so good. New ways to control phosphorus runoff are being tried throughout the watershed. Work in urban areas has included installing new stormwater basins to reduce water runoff and picking up phosphorus-rich leaves that fall into gutters and end up in the lakes. In rural areas, farmers are getting paid to pilot land management practices that can keep phosphorus-containing soil and manure from running off their fields during rain storms, such as cover cropping, strip tilling, and vertical manure injection. MMSD is gearing up to apply for a five year Watershed Adaptive Management Option permit for the entire Yahara Watershed. The Yahara WAMO effort has been touted as a brand new way to reduce nutrients harmful to water quality in a region. But in fact, while it is unique in a few respects, this option actually draws on market-based environmental management precedents from the last couple of decades. In particular, it is very similar to water quality trading programs. Water quality trading (WQT), which allows regulated pollution sources to trade pollution credits with upstream polluters to improve water quality, is now widely promoted by the Environmental Protection Agency. As of 2013, 15 US states have passed legislation enabling water quality trading, and nearly three dozen programs have been established. We can look to water quality trading and other programs that have used market exchange principles to reduce pollution in considering the prospects for, and potential challenges of, the Watershed Adaptive Management Option. Programs must grapple with issues such as recruiting participants in pollution trading and uncertainties in predicting and measuring pollution reductions. Particularly challenging is the question of how to deal with unevenly distributed pollution sources across a diverse landscape. In other words, the impact that one storm drain or one farm field can have on the level of pollution in a particular stream varies dramatically, depending on different factors including the slope of the land, how water moves across it, and the location of the pollution source with respect to the stream of interest. Carbon trading, perhaps the best known market-based option for pollution reduction, highlights the significance of this variation. In contrast to water quality trading, carbon trading works more logically as a market because greenhouse gases are uniformly mixed in the atmosphere. The impact of a ton of carbon reduced in one place should equal the impact of a ton reduced elsewhere. Under the US Regional Greenhouse Gas Initiative, for instance, a power plant in Massachusetts can buy a carbon credit from a plant in Maine, and we can have confidence that there has been an overall reduction in global greenhouse gases. Water quality trading programs have had to come up with mechanisms to address the uneven mixing of pollutants in water. For example, under the Minnesota River Basin phosphorus reduction trading program, regulators address the variability in how much phosphorus pollution trading partners contribute by increasing or decreasing trade ratios. To illustrate, pollution sources that are closer to the monitoring station, which calculates the program’s phosphorus reduction, are assigned a lower trading ratio—e.g., a 2:1 ratio, meaning less phosphorus must be removed by that source to achieve one unit of reduction at the monitoring station. Pollution sources that are farther upstream are given higher trading ratios—e.g., a 4:1 ratio means they must remove much more phosphorus to produce the desired results all the way downstream. Though the Minnesota River trading program differs from the Yahara WAMO substantially, it offers one example of how upstream-downstream differences can be accounted for in a market-like program. The unevenness of water pollution sources is just one of many issues that will have to be considered as the Yahara Watershed Adaptive Management Option moves into full implementation. Looking to neighbors for lessons learned highlights many of the questions that Yahara regional organizations will grapple with in their work to improve regional water quality. This entry was posted in policy and governance, water quality and tagged Chloe Wardropper, Clean Water Act, Madison Metropolitan Sewerage District, phosphorus, US Environmental Protection Agency, water quality, water quality trading, Watershed Adaptive Management Option, Wisconsin Department of Natural Resources, Yahara Watershed. Bookmark the permalink.